FAQ - Sinusitis - WS Tichenor M.D. Why can't the cilia move the mucus out? What other treatments are used? What other non drug remedies can be used? How long do I have to take antibiotics? Can I use an over-the-counter nasal spray? Can you do a culture to find out what bacteria are causing the problem? How much water do I have to drink? How often is follow up necessary? What role does a deviated septum play in sinusitis? What role do food allergies play in sinusitis? What if the surgery doesn't help? What is the importance of a fungus in sinusitis? The sinuses are air pockets located inside the bones in the skull. They are located to either side of the nose (maxillary), behind and in between the eyes (ethmoid), in the forehead (frontal), and there is one much further back in the head (sphenoid). (For a better understanding of this, please look at the CT scan page when you finish reading this page.) They are probably present to reduce the weight of the skull as well as to create resonance to the voice. The sinuses are lined with very fine hair-like projections called cilia. The function of the cilia is to move mucus ( which is normally produced by the sinus) towards the tiny hole ( the ostium) about the size of a pin hole which provides drainage for the sinus. Unfortunately, that hole is located at the top of the largest sinus, and consequently drainage may be poor. Sinusitis starts as a result of blockage of the hole (actually a short hairpin shaped tube) into the sinuses, called an ostium. This blockage can occur as a result of an anatomical obstruction, swelling due to a cold or allergy, drying of the mucus, or a foreign body. When this occurs, mucus that normally is expelled from the sinus builds up in the sinus. This can cause pressure or pain. In addition the mucus is an excellent culture medium for bacteria. If the mucus is not cleared immediately, an abscess can develop in the sinus. An abscess is a pus-pocket inside a closed space. Ideally, treatment of an abscess involves opening the abscess up with a knife and allowing the abscess to drain to the outside. Unfortunately, this is obviously not feasible in the case of a sinus infection without doing extensive surgery. As a result, we prefer to use medical treatment which can usually treat sinusitis so that surgery does not have to be performed. Sinusitis is one of the most common medical problems affecting approximately 30% of the population at some point. Acute sinusitis commonly follows a cold and typically lasts for up to three weeks. After 12 weeks it becomes defined as a chronic sinusitis and may become much more difficult to treat. Since the Spring of 1990, we have noticed a significant increase in the number of people who have sinus infections. The reason for this is not clear at the present, but it is most likely due to increasing amounts of pollution and ozone. There have been similar increases in other major cities in the United States. It may also be due to use of antibiotics. It may be extremely difficult to diagnose a sinus infection early in the course of the disease. After taking a careful history, which is extremely valuable in helping diagnose sinusitis, and doing a physical exam, the diagnosis is typically made by looking inside the nose with a flexible rubber or rigid steel tube called an endoscope. Depending on what is found at the time of the endoscopy, an x-ray (CT scan) of your sinuses may need to be done. Previously, x-rays of the sinuses were done. Now CT scans are ordinarily done because a much greater amount of information can be gleaned from the CT scan, and at a very slight increase in the cost. If you need to have surgery, a CT scan will ordinarily be done prior to surgery. The CT scan is often performed in a special way ( called coronal views) so that certain portions of the sinuses are better seen. Endoscopy and CT scans are now done very commonly for sinus infections. Many doctors and all sinusitis specialists can look inside your nose with the endoscope. It's not painful but might be a little uncomfortable. Don't worry - your nose is sprayed first with a local anesthetic. Believe it or not, I've done it to myself! There is a section later in this website with CT scans, and an explanation for the layman. Don't be afraid to look at them. By the time you finish, you are likely to know more than your doctor! CT scans involve use of radiation, and although there is not a lot of radiation used, it becomes preferable to diagnose sinusitis with an endoscope. 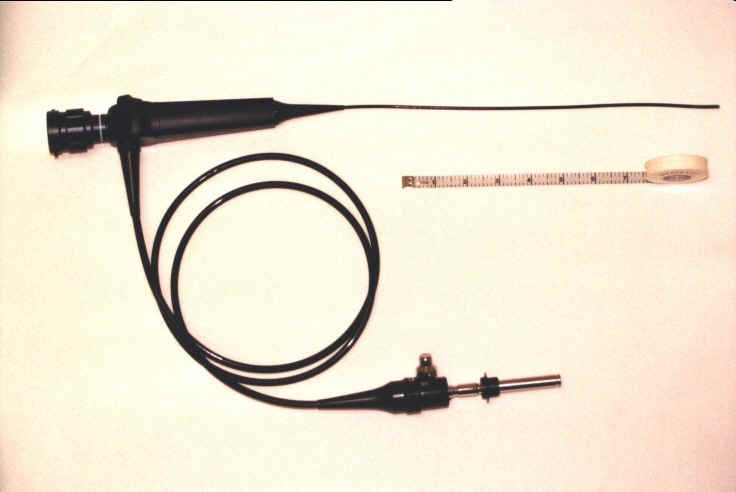 The problem is that most doctors are not trained in the use of the endoscope. There are tiny hairs in the sinuses called cilia. They beat like waves and move mucus out of the sinuses through a tiny hole (actually a short tube). The tube forms a hairpin turn and is only about 1/6 of an inch in diameter. Obviously it is very easy for this to get blocked. Typically, early in the development of a sinus infection, the cilia (tiny hairs lining the sinuses) are lost and mucus becomes increasing thick. Consequently, the mucus is retained in the sinus. If the sinus infection lasts for a long enough period of time, the lining of the sinus may actually physically change, causing an even thicker mucus to develop. The bacteria become trapped in all of the nooks and crannies and proliferate. Once this happens, it becomes more difficult to treat and it becomes possible that medical treatment may not work and you may need to have surgery. Although surgery may be avoided, treatment at this point becomes extremely difficult and many doctors may not know how to treat it medically at this point. Given the above problems, it is obviously important to treat a sinus infection as soon as it starts to occur. As a result of sleeping, patients will often breathe through their mouth, not be able to clear the mucus from the nose and also not swallow. As a result, mucus is often pooled in the back of the nose and throat causing irritation. That is a very difficult question to answer. Assuming that you are not from New York, I would suggest that you go over the information in the website carefully and discuss it with your doctor. You might want to ask him to look at the information in the physicians section, or print it out for him or her. Hopefully you can get them to be receptive to the ideas which I have compiled here. If you feel that you are not getting better, and your doctor is not receptive to trying some of the treatments in here, I would suggest that you find an allergist or otolaryngologist who may be better able to treat you. If you are located near a medical school, call the department of allergy or otolaryngology and ask to see someone with extensive experience in treatment of sinusitis. Commonly used antibiotics such as penicillin, erythromycin, and tetracycline may not work because the bacteria have become resistant. Antibiotics such as amoxicillin and sulfa drugs may be used as first line treatment for sinus infections, but they commonly do not work in patients who have had infections for more than a short period of time or who have been on multiple antibiotics previously. We then may have to use one of the newer antibiotics - they are expensive, sometimes $100 per week or more. We commonly may have to use several different antibiotics until we can find the correct one. It is important to understand that some people are cured by antibiotics like penicillin, but it's not as likely to work as one of the other, newer antibiotics. If you would like a list, see the physicians section. It is also important for a doctor to do cultures from the sinuses in order to find out what antibiotics can be used. A swab in the nose does not indicate what the bacteria are in the sinuses. The culture must be directed using an endoscope in order to get a better indicator of what is going on in the sinuses. We also use decongestants like Sudafed to reduce the swelling inside the nose, as well as drugs such as guaifenesin (the active ingredient in Robitussin) contained in Mucinex ( non-prescription) as well as several prescription medications. to reduce the thickness of the mucus. These must be used in high dosages, typically 2400 mg. per day. Discuss that with your doctor because there can be side effects. There may also be other medications used if you have problems like heartburn from reflux, which can cause inflammation of the sinuses. In addition, it is important to treat other medical problems which may occur as wel. Those are reviewed in this website. Many patients will report that breathing in eucalyptus oils will help open the nose. Steam rooms are also often helpful. Patients often report that after a hot shower their nose seems to open up and they are more comfortable. Some patients also report help with garlic. I have even had some patients who stuffed garlic cloves up their nose!! Chinese herbs have been used, but we cannot endorse these nor do we know of any studies showing they are effective. Irrigation, saline nasal sprays, and other medications can be helpful which are listed on the treatment regimen page. If you haven't looked at them, you should do so now. But remember if you choose to use these non drug treatments, they must be used in conjunction with prescription medication in order to avoid serious complications. Because penetration of antibiotics inside the sinuses is poor, an extended treatment is often necessary. Antibiotics do not penetrate well into bone and the bacteria in chronic sinusitis are located inside bone. Typically a minimum of three weeks or more of antibiotic treatment is necessary for patients with chronic sinusitis. Sometimes 6-8 weeks of treatment may be necessary. In some cases multiple different antibiotics need to be used. If antibiotics have not worked, it is often important to take directed cultures, not just a simple swab in the nose, using an endoscope, to determine which antibiotics should be used. Antibiotics should not be arbitrarily chosen because they make not kill the bacteria which are present. In some cases where patients do not get better after they have been treated with an adequate course of antibiotics, they will receive intravenous antibiotics instead of, or as preparation for surgery. Approximately two-thirds of the patients with sinus infections that we see have some problems from medications. Common side effects include lightheadedness, dizziness, spaciness, difficulty concentrating, jitteriness, being hyper, rapid heart beat, difficulty sleeping, nausea, bloating, rectal itching, burning on urination, fatigue, and so forth. A lot of these side effects can also be due to the sinusitis. And because side effects occur so commonly, it takes an experienced physician to be able to deal with the problems. Judicious use of a decongestant nasal spray such as Afrin, used according to directions for three to five days, is also advisable in many patients. Extreme caution must be used in order to prevent worsening of symptoms or addiction to these sprays. The over the counter steroid nasal sprays can also be used such as Nasacort, Rhinocort and Flonase ( also available in generic formulations), but you really need to discuss the use of those steroid sprays with your doctor. Note that there is no risk of addiction with the steroid nasal sprays, but there can be other side effects - check with your doctor. It is also extremely important for most people to use a humidifier, especially in the winter. I prefer a hot mist vaporizer, as long as there isn't any reason not to use one, such as someone around who might get burned. It should preferably be placed at your bedside every night, to thin out the mucus. Short of a vaporizer, breathing in steam on a regular basis by boiling water can be used but is not as satisfactory. We use a special apparatus in the office called a Rhinotherm. This machine blows out a heated mist through a nozzle which patients can then breathe in their nose. Many patients find it helpful. It is expensive though and therefore not well suited for home use. Items such as a personal steamer may be helpful. In patients who are allergic, we like to keep the humidity less than 50 % to prevent mold and dust mite growth. ( See the allergy section for more information.) You can obtain a humidity gauge from a hardware store. Vaporizers need to be cleaned on a regular basis, to prevent mold accumulation. Hot mist vaporizers are typically less of a problem than cool mist, since the water is boiled before it comes out of the vaporizer. Unlike most infections ( for example a strep throat), where it is possible to determine the exact bacteria by doing a simple culture, it is not possible to simply take a culture from your nose to determine what the cause is of the sinus infections. The bacteria inside the nose which we could theoretically culture are not the same as the bacteria growing in the sinuses. It is possible to take a culture from the drainage area of the sinuses, but this is something which typically must be done by a specialist using an endoscope. The other way to determine which bacteria are in the sinuses is to insert a needle into the sinuses through the nose, obviously an invasive and potentially dangerous procedure which we would prefer not to do. Under some circumstances, antihistamines are used, if allergies play an especially prominent part in the symptoms. Because of the fact that oral antihistamines tend to be drying, we usually try to avoid them in treatment of sinusitis. We will more commonly use the prescription antihistamine nasal sprays ( Patanase, Astepro and Astelin, now available generically). The mucus in the sinuses can sometimes get dried out by antihistamines and is plastered up against the wall of the sinuses. The bacteria love it because they are trapped inside the sinuses with nowhere to go. They reproduce like crazy and since the mucus is dried out, a blockage in the small drainage canal can occur and so mucus remains inside the sinuses. Unfortunately people feel better initially because the volume of fluid in the sinuses initially is reduced, but eventually symptoms return. Because of the fact that we are dealing with an abscess which can not be adequately drained without doing a major surgical procedure, it often takes an extended period of time for the sinus infection to be completely treated by what we can call medical drainage. Some physicians often will only treat patients with sinus infections for a week or ten days and as a result patients are partially cured, but never get complete relief of symptoms. It is critical that treatment occur for a minimum of several weeks, and commonly patients may need to be treated for several months. Antifungal agents may need to be used for an even longer period of time. We commonly continue non-antibiotic treatment after stopping antibiotics. If patients don't get better, it is important for them to be evaluated for surgery, but it is important to stress that the vast majority of patients do not need to have surgery. One problem is that most doctors (including ENT's) don't have enough familiarity with treatment of sinusitis with medical therapy to adequately treat it. As a result, there are a lot of people who have surgery who might be able to be effectively treated with medication. A wide variety of non-traditional treatments have been used in treatment of sinusitis. Acupuncture has been used to help open the sinuses allowing the mucus to drain better. I had acupuncture before surgery. It helped, but I still had to have surgery. Most patients we have seen have felt that it has helped open their sinuses up, but no studies have confirmed this. A CT scan (x-ray) done before and after on our several of our patients has not shown any substantial change. It is important to drink a minimum of eight glasses of water per day. Ideally, 15 or 20 glasses may be helpful in order to thin the mucus out and allow adequate drainage. Some of the medications tend to make you very thirsty. I was once at a dinner when I was so thirsty that I drank 12 glasses of water! Alcohol very commonly causes worsening of sinusitis, often not so much because of an allergy, but because alcohol functions as a diuretic. It often causes patients to become dehydrated, leading to drying and thickening of the mucus which may, in turn, cause a blockage of the opening of the sinuses and a worsening of the infection. In addition, when patients come home after having several drinks, they often may forget to take their medications and don't turn on their vaporizer leading to worsening of the sinus infections. In patients who are allergic to red wine, yeast, sulfites or other components of the alcohol, that may compound the problem by causing allergic swelling of the nose. It is important to schedule follow-up visits in order to make sure that treatment has been adequate. The most common reason why patients develop future problems with sinus infections is because they stop the medications too soon. This could be avoided if they came back for scheduled appointments and had any other problems addressed. Believe it or not, your nose is not just a decorative object found on your face, it really has a purpose. It is extremely important to keep the nose clear so it is possible to breath through the nose. It has been found that air exchange into the sinuses occurs twice as rapidly with nasal breathing. The air exchange will reduce the likelihood of bacteria growing in the sinuses. We have patients call our office if they do not start feeling better within several days after coming in. If they're not feeling better, it usually means they need some change in medication. The septum is the bone and cartilage which separates the two sides of the nose. A deviated septum is simply a crooked septum. A deviated septum commonly can cause or exacerbate chronic sinusitis by causing a blockage of the nose and also of the drainage area from the sinuses. Most people have a somewhat deviated septum. Just because your septum is deviated, it doesn't mean that it is causing a problem-but it does need to be evaluated. There are some patients who have such a severe deviated septum that they need to have surgery. That may need to be evaluated by an otolaryngologist or sinusitis specialist. When surgery is done for sinusitis, the deviated septum is often straightened at the same time as the surgery is done on the sinuses. Nasal polyps are not true polyps but rather are probably caused by inflammation in the nose. They look like peeled grapes but are basically fluid-filled sacs. They can be found anywhere in the sinuses or nose and commonly are associated with sinus infections. They can cause a blockage of the drainage holes (ostia) from the sinuses, causing a back-up of mucus in the sinuses. Nasal polyps are often associated with asthma and can be made worse in some people by ingesting aspirin or related drugs. Treatment involves steroids, treatment of sinusitis, and treating any allergies. They may sometimes need to be removed surgically, but surgical removal doesn't mean that they won't come back. They are not precancerous in most cases. Patients who have an allergy to Aspirin and other related medications can be desensitized to Aspirin. It is also thought that some people with polyps may have them related to immunological overreactions to bacteria or fungi. Treatment of that kind of problem is complicated and needs to be addresssed by a medical specialist in sinusitis. Many patients with chronic sinusitis have allergies which may partially complicate sinusitis. Allergies cause swelling and blockage of the tiny holes which allow drainage of mucus from the sinuses. In addition, the allergies may cause swelling inside the sinuses and inside the nose. It is critical that patients with allergies control their environment in order to control their sinusitis. Because so many patients with sinusitis have allergies, we have included a section on allergies later in this website as well. In patients who have chronic sinus infections, I think it makes sense to do anything to avoid worsening of symptoms or surgery. If we find a patient is allergic and has chronic sinusitis, we often suggest getting allergy shots to desensitize them to the various things to which they are allergic, in the hope that it will help with the sinusitis. Because allergy shots take 6-24 months to work, they must be used in conjunction with other treatment, including controlling exposure to environmental agents. We commonly include an evaluation for allergy to a large number of molds in patients who have sinusitis. The effects of food allergies in treatment of sinus infections are very controversial. This is something that the patient needs to discuss with an allergist well acquainted with treatment of sinusitis. Briefly, food allergies are much more common in children than in adults and can sometimes cause problems with sinusitis, but much less commonly than environmental agents like dust, molds, pollen, animals and believe it or not: cockroaches. Milk may cause problems in some patients, but probably less than 15% of patients with sinusitis. A small percentage of patients with chronic sinusitis will fail to improve even with the best medical treatment. In most studies of patients treated by allergists who specialize in treatment of chronic sinusitis, this is less than 10% of patients who have had optimal medical treatment. It is important to realize, however, that surgery is frequently performed on patients who have not had the best medical treatment prior to surgery. The most well respected medical review organization, called the Cochrane Review, has evaluated medical versus surgical treatment of sinusitis and has found that surgical treatment does not have an advantage over medical treatment. This doesn't mean that people should never have surgery, but I think that it indicates that many patients would do as well with medical treatment. This web site is one of many attempts to educate physicians and the public about the treatment of chronic sinus infections. Although many physicians, including ear, nose and throat doctors and allergists treat chronic sinusitis, some physicians do a better job at it than others. There is an ongoing effort by a small number of specialists to educate both physicians and the general public about the best way to treat sinusitis. When that job has been completed, I will be able to close down this website and retire. Unfortunately, I don't think that will be for a while. You should first understand that I am not a surgeon, so this is from the perspective of someone who has seen the surgery, and had the surgery done, but who doesn't do the surgery himself, even though I have done the surgery on cadavers. The surgeon uses a rigid tube (endoscope) which is inserted into the nose. The entire operation is done through the nose. Previously, the surgery was done using an incision underneath the lip called a Caldwell-Luc procedure. This caused an extended post-operative healing time as well as occasional loss of sensation in the face and was not nearly as effective as the current surgery. That kind of surgery rarely need to be done now. The current surgery involves opening up the naturally occurring openings (ostia) from the sinuses into the nose. (They are at the top of the sinuses). The older Caldwell- Luc procedure involved making a drainage hole in the bottom part of the nose, with an extensive amount of removal of tissue from inside the nose. It was logical, but unfortunately it didn't work as well because mucus flows upwards toward the top of the sinus aided by tiny hairs called cilia. In addition, removal of the tissue from inside the sinuses caused scarring, so that now very little tissue is removed from inside the sinuses. There are a variety of different methods which may be used to perform the surgery. Cilia are tiny hairs lining the respiratory tract which beat in a wave-like fashion to move mucus out. They are paralyzed by cigarette smoke. Cilia move mucus to the opening of the sinuses into the nose. Unfortunately that opening is located at the top of the sinuses. (It worked well for our prehistoric ancestors who were on all fours, but doesn't work as well for us. Try it-get down on your hands and knees with your head looking at the ground and you'll see). Generally, patients will remain in the office, ambulatory surgery center or hospital just for the day of the operation, but sometimes overnight. Patients are usually out of work for 1-2 weeks. Full recovery may take six weeks, although for periods of six months to a year patients may become more sensitive to infection. The surgeon will typically remove crusting on a regular basis from the nose to prevent scarring from occurring, typically after the first, third and sixth week. Packing is often not placed nowadays, so that the removal of crusting isn't usually that uncomfortable, although a splint may be used to reduce the likelihood of scarring. In addition a steroid impregnated dissolvable device (Propel) may sometimes be placed to improve the outcome. There will be limitations on lifting, blowing the nose, and flying for a short period of time, while the healing occurs. Ask your doctor about irrigating with saline after the first week. Most people don't have a lot of pain, but if you do, ask your doctor for pain medication. Most patients don't have external bruising after the surgery. More recently some doctors have started using a balloon to open up the sinuses. A thin wire is passed through the nose guided with an endoscope and sometimes with an X-Ray and then placed into the ostia of the sinuses. A long thin balloon is then inserted over the wire into the opening of the sinuses and a balloon is then blown up which creates a larger opening into the sinuses. A detailed discussion of the advantages and disadvantages of the balloon technique is beyond the scope of this website. The decision of whether to use the balloon should be discussed with the surgeon because there is still controversy about its use. Elsewhere in this website, there is a more extended discussion of sinus surgery. We would suggest that you may wish to look at those sections as well. As we stated earlier, just because you have surgery, it doesn't mean that you won't get sinusitis any more. It also doesn't mean that polyps won't come back. Surgery is not meant to cure the disease. Once the sinuses have been opened up by surgery, it is possible to wash out the sinuses if necessary, and as a result, sometimes oral antibiotics don't have to be used. After surgery, it is easier to perform an endoscopy and find out exactly where the cause of the problem is, since it is possible to more easily examine the inside of the sinuses once surgery has been done. Cultures can be done, just as they can be done prior to having surgery, so that antibiotics can be selected based on the findings from the culture. Elsewhere on this website, there is a section on treatment of sinusitis after surgery. First, be patient, recovery from surgery takes weeks (occasionally months). If you aren't better at that point then there are many possibilities including allergies, immune problems, fungal infection of the sinuses, scarring from the original surgery, sinusitis involving sinuses other than those originally operated on, etc. If you have these kinds of problems, it is critical that you see someone who is well experienced with medical treatment of patients after surgery. Unfortunately there are very few doctors in that category. Please review the section of this website on sinusitis after surgery for more information about what happens if you don't get better after surgery.. I have seen patients with problems like hives which wouldn't get better, they had no other symptoms. The hives got better immediately with treatment of sinusitis. I was amazed. Sinus problems may also cause all kinds of allergies to worsen (it seems that sinusitis turns on the immune system) and can cause problems with asthma, intestinal symptoms, and a wide variety of other medical problems. I have had patients who have toothaches and have numerous dental procedures to no avail. "Migraines" are an especially common manifestation of sinusitis. One study found 50% of chronic migraine patients had chronic sinusitis. Although rare, serious complications can occur as a result of sinus infections. This includes spread to the brain, eyes, and a blockage of vessels in the head. In addition, erosion of bone can occur as a result of the infection eating through the sinuses. Not a pleasant thought, and more incentive to get it properly treated. It used to be thought that it was unusual, but we are now finding it more common that sinusitis can be caused by immune problems. In patients who have persistent sinus infections which are difficult to treat, it is not unusual for there to be an immune system problem. Under those circumstances, it is important to have the immune system evaluated by an allergist/immunologist, especially before surgery is done. Testing is done with blood tests to check the gamma globulin levels. In addition, immunizations are done to check if your immune system is able to respond normally to bacteria. These tests are done with killed basteria so you can't get an infection with them. You may need to have allergy tests done, as well as tests done to make sure that you have normal amounts of gamma globulins as well as immunizations to make sure that you can form antibodies normally to common bacteria. ( For more discussion, please see the letters section.) Rarely, it can be due to AIDS, but don't jump to conclusions: 99.9% of people with sinusitis don't have AIDS. Once your sinus infection has been treated, it is important to try to prevent future sinus infections, but they often occur. It is important to provide adequate treatment of colds and allergies in order to try to prevent blockage of the sinuses. We commonly suggest that people start many of the medications, with the exception of antibiotics, at the first sign of development of cold symptoms. You should talk with your doctor about that possibility. The more frequently that sinus infections occur, the more likely it is that surgery may be needed in the future. About 70% of people with chronic sinusitis have asthma as well, but it doesn't necessarily have to debilitate you. It has been found that about 15% of Olympic athletes have asthma. For more information, see the section on Asthma in this website. What is the importance of immunological reactions to fungus or bacteria in sinusitis? An article published in the Mayo Clinic Proceedings in September, 1999 by Dr. Gene Kern and a group at the Mayo Clinic suggests that fungal sinusitis may be much more common than previously thought. Fungal growth was found in 96% of patients with chronic sinusitis. The difference between those with chronic sinusitis and the normal population was that their eosinophiles ( a type of white blood cell involved in allergic and other reactions) had become activated. The eosinophiles had released a product called Major Basic Protein which attacks the fungus but is very irritating to the lining of the sinuses. It is then speculated that this injury allows the bacteria to proliferate. The concern is whether our treatment of sinusitis should be directed at treatment of the fungus rather than the bacteria. This topic is extremely controversial, but many specialists in sinusitis now agree that it is an important factor in some patients with sinusitis. For more information please go to the separate page on fungal sinusitis, the address of which is below. Antifungal agents such as Sporanox or Amphotericin B can be used either as oral agents or topically. Both are difficult to use for a variety of reasons, but work is being done on these and other agents. That is an area that requires an extensive amount of work. Surgery, irrigation, steroids and immunotherapy are helpful, but it can be extremely difficult to treat. Another theory to the cause of chronic sinusitis with nasal polyps was developed by Dr. Claus Bachert. He has found that patients with chronic sinusitis with polyps will develop IgE (the antibody causing many allergies) antibodies to a toxin from Staphylococcus aureus called the S. aureus enterotoxin. The antibodies have been found in polyp tissue. Some patients with this problem have been helped with a medication (Xolair) which will block the antibodies, but the FDA has not approved it for treatment of sinusitis. Unless your doctor has familiarity with obtaining approval for that reason, it may be difficult to obtain because it is expensive. The contents of sinuses.com © 1996-2017 by Wellington S. Tichenor, M.D. Last update January 8, 2017. Reproduction for educational, not-for-profit purposes is permitted if this source is credited and the author of this website is notified of any reproduction for other than personal use. If used on the internet, a link would be appreciated.